Is it too late to add to my baby book? I've perused antique shops dozens of times before having children, but never bought any furniture, only an occasional dish or trinket. I visited the West End Antique Mall for the first time this week, and did so with a mission: to find one or two dressers for Dan and myself, for the new house. We currently use our big new-house closets to store everything but will not have that option after we move. I found, and subsequently fell in love with, a matched set of Berkey & Gay walnut chests of drawers - a low 3-over-2 and a taller 5 drawer chest. Both have burl veneers and a painted floral motif, and my internet research puts them at approx late 1920s or early 1930s, which nicely coincides with the age of the new house. The drawers are in amazing condition and each chest has a tiny little velvet-lined jewelry section and lidded box in the top drawer. I asked for a discount and got it (wuwu, haggling for beginners! 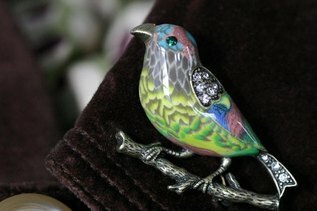 ), and picked up a cute little birdie pin for my jacket and a necklace that looks like candy, to boot. Thus begin the adventures of Jess the Antique Buyer. I'm on the lookout for a Hoosier cabinet, let me know if you see one!